In my Temok Hosting review, I found Temok is a affordable hosting service for small business websites and blogs. It has good customer support, reliable speed and SSD support. Scroll below for the in depth review. Are you looking for a cheap hosting service for your blog? Read this Temok.com hosting review to see if it is offering reliable web hositng services at affordable price. Did you know that there are over 150 companies offering web-hosting services? Having said that, when you have too many options, it becomes difficult to choose the best hosting service that suits your blogging needs. Web hosting you choose plays a crucial role. Not only it impacts your website speed but it also makes or breaks your website’s success. No one likes slow loading sites, right? So in this post, I’m going to discuss about an incredible hosting service called Temok.com which offers you affordable shared hosting plans along with a wide range of features. Let’s start with Temok hosting review. Let’s get into the unbiased review of Temok web hosting without much ado. Temok web hosting review 2016: Why should you use it? Since Temok provides very affordable hosting services, we have to make sure that the features it provides are in full competence with other popular web hosting services out there. Here are the features of Temok web hosting service, both shared and VPS hosting plans. Based on this we will decide if it worth the investment. A quick tip: If you are looking for the best WordPress hosting, always go for something which offers cPanel. While cpanel isn’t necessary for code geeks, they are extremely helpful to non-coders like me who don’t want to get their hands dirty with all those complex optimization settings. A cPanel not only helps you with 1-click installation of your WordPress blog but also helps you to manage minor tasks of your site without having to pay hefty sum to a developer each time. A control panel (cPanel) is what makes it easy for you to create and manage your email accounts, files, databases, protect your sites and install WordPress safely within a few minutes etc. And here’s where Temok comes into play which offers extremely easy-to-use control panel. Even if you don’t have any technical skills, you will find it easy to manage your WordPress sites. Here’s what you all get within their control panel. Did you know that Temok offers weekly-automated off-site data backups? Yes, they do. The surprising thing is, they do it without charging you anything extra. By offering shared hosting plans at such a low price tag, they are still able to take care of your website’s data. How cool is that? If you are wondering what are off-site backups, let me explain. Automatically taking backup data of your whole sites to a remote server is called “offsite backup”. So you can get full access to your website data (files, emails, blog posts, images, media etc) even if you lose it all accidentally. Temok is unarguably the best and cheapest shared hosting option that you have right now on the web. If you are wondering why, have a look the following things they offer. 9% uptime guarantee: You don’t want your website to shut down all of a sudden, right? 99.9% uptime tells you how great a website is performing without any interruption. Hosted on Cloud Linux: This allows Temok to limit its clients CPU usage so it can distribute the system resources equally which doesn’t result in slowing down all the sites run on the same hosting server. Green web hosting: If you are a nature love and support wind energy, you love this hosting service. They have invested in wind energy to provide climate friendly hosting services. 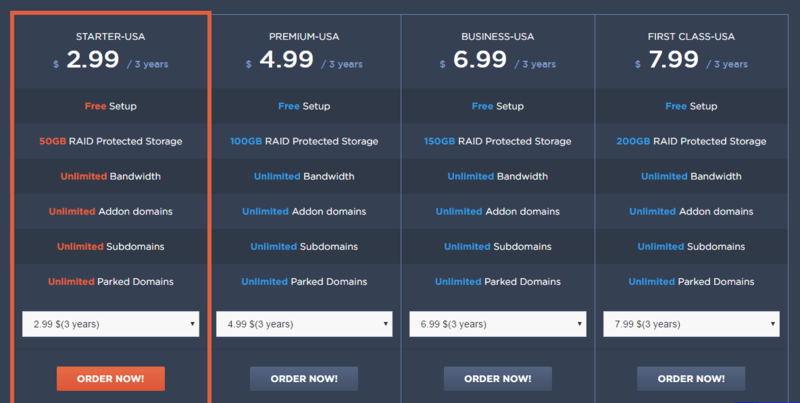 What about the pricing of Temok’s Hosting? Temok shared web hosting is known for its affordable hosting packages. They are currently offering 4 different hosting plans starting from $2.99/mo and goes all the way to $7.99/mo. Let’s now have a brief look at these 4 hosting plans provided by Temok web hosting. 1) Starter Plan: This plan is perfect for the beginners who are on a tight budget. This plan costs you just $2.99 per month if you get the hosting for 3 years at once. Here are few features of this plan. Are there any freebies that you get with Temok web hosting? Yes, you will get the following freebies with each and every hosting plan. Temok.com also provides you domain name registration services in case you want to have all your accounts under one roof. Temok sells almost all the domains name extensions and include fancy custom domains like .club or .biz in case you want to brand your blog. Click here to check out the domain variety. Here are a few honest things that you should know before making your decision to buy Temok hosting. #1 The user interface of their website is a bit old and out-dated. Having said that, let me tell you it doesn’t matter much since you will not be opening their website much after installing your blog on it. Let us be honest with you, Temok.com is a beginner friendly hosting service for newbie bloggers. It is reliable and fast but when it comes to power users, there are better alternatives. Suppose you run a viral content site or a site that receives million of hits per month or at least 1000 real time visitors, I would recommend you to check out other powerful and recommended VPS hosting solutions. After reading this detailed Temok web hosting review, if you are still thinking about whether or not to start using Temok shared web hosting to host your WordPress sites, have a look at the following 3 reasons. Timok support staff is always available to help you if you face any website hosting related issues. You can avail their help anytime around the clock 24 hours a day, 7 days a week and 365 days in a year. They have multiple customer support options which include phone calls, live support chat or raising a ticket from their control panel. Are you a beginner and don’t know how to install WordPress on your hosting service? I’ve a great news for you. Timok hosting service offers you free setup. It means, you can simply ask for their assistance to install WordPress on their hosting servers once you buy their hosting. Temok technical team has over 8 years of experience in web hosting industry and they are serving over 8000+ customers all over the globe. Their experienced developers are always ready to help by giving 100% satisfaction to the end users i.e. YOU. Apart from this, you will get a 15 days money back guarantee which means you will get a full refund on any of the plan if you are not satisfied with their hosting services (if you claim within the 15 days of the purchase). Customer friendly support staff, affordable hosting plans, weekly automated backups – all these features make Temok web hosting so incredible and sets apart from all its competitors. If you are looking for an affordable, easy to use and reliable shared hosting service, I highly recommend you to try Temok hosting. After all, their hosting plans start at just $2.99 per month and then there’s a 15 days money back guarantee, so you won’t regret giving a try to their hosting plans. What are your thoughts on Temok.com web hosting review? Do you have any questions mind? Shoot them in the comments below. It seems temok hosting is a very good hosting service. It looks like from your post that Temok is a very good hosting providers. very informative post.